Dengue Fever- A band recognized for its trademark blend of Cambodian pop and psychedelic rock. Some of their songs are also in English. Check out one of my favorites at clip below. The children are friendly and much fun to talk with. They love to practice their English with you. Many of these children are also selling various items outside the tourist areas. It is not recommended to give away money or even purchase the items from the children. The reasoning by various leadership in Cambodia is because it perpetuates a vicious cycle of poverty to continue. The families see it as an opportunity to make a quick few bucks which discourages the kids from going to school and thus furthering their education. In the end it becomes unsustainable by enabling a dependent system that produces another generation in poverty. The other thing to watch out for is what is called the Orphan Tourism. Some orphanages are not even legit. It can be a big scam and money-maker using kids from throughout the village to create a heart tugging display to reach deep into your pockets. If you do find a legitimate orphanage, this rule still applies. Children are not there for your display and amusement. You see them, have a good time, and then go home. They see you and only hope that maybe you will be their new home. Well intentions sometimes can actually do more harm. The best way to help more sustainably is by funding or giving of some real committed time and talents to a solid organization that has been well established. 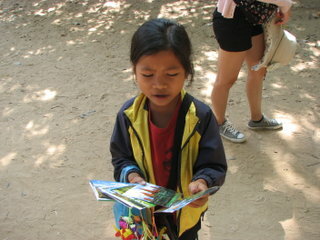 Even better, help empower the Cambodian people in a mutual learning relationship. This will help them continue to develop leaders within their own country as they desire and are very much capable of doing with a little support. It is best to go through your Consulate for recommendations on who and how to best help.